See product image gallery for size guide chart. Thickness: 5/4mm (5mm core, 4mm underarm for flexibility etc). Material: Nylon and rubber. Panelling: Ergonomic Panelling for a superior fit. 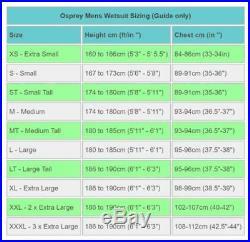 Osprey Origin 5/4mm Winter Wetsuit. The Mens Osprey Origin Winter Wetsuit has been developed to keep you insulated and warm during the coldest conditions. Perfect for all water sports including surfing, kayaking, wakeboarding and kite surfing, the 5/4mm thick full length wetsuit will keep you warm and in the water for longer. The 5/4mm specification means that the panels are formed of 5mm thick warm insulating rubber, with 4mm panels under the arms, where you need more flexibility and stretch for paddling and surfing. A 5mm full length wetsuit is the standard thickness for an autumn and winter wetsuit in the UK and Ireland, and Europe. This extra neoprene thickness coupled with Supratex® knee pads and flatlock stitching results in the complete winter wetsuit package. Doused also in unique Osprey design elements, the wetsuit has been adorned with stylish accents and the familiar Osprey O branding. A great choice for beginners and intermediates alike, this wetsuit will let you enjoy your water sport of choice during even the coldest winter weather. The item “Osprey Origin 5mm Wetsuit Mens Adult Full Length Winter Neoprene Steamer” is in sale since Tuesday, September 4, 2018. 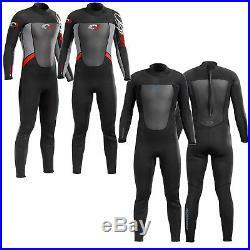 This item is in the category “Sporting Goods\SCUBA & Snorkelling\Wetsuits\Full Length”. The seller is “actionstationshop” and is located in Sunderland. This item can be shipped to United Kingdom, Antigua and barbuda, Austria, Belgium, Bulgaria, Croatia, Cyprus, Czech republic, Denmark, Estonia, Finland, France, Germany, Greece, Hungary, Ireland, Italy, Latvia, Lithuania, Luxembourg, Malta, Netherlands, Poland, Portugal, Romania, Slovakia, Slovenia, Spain, Sweden, Australia, United States, Canada, Brazil, Japan, New Zealand, China, Israel, Hong Kong, Norway, Malaysia, Singapore, South Korea, Switzerland, Taiwan, Thailand, Bangladesh, Belize, Bermuda, Bolivia, Barbados, Brunei darussalam, Cayman islands, Dominica, Ecuador, Egypt, Guernsey, Gibraltar, Guadeloupe, Grenada, French guiana, Iceland, Jersey, Jordan, Cambodia, Saint kitts and nevis, Saint lucia, Liechtenstein, Sri lanka, Macao, Monaco, Maldives, Montserrat, Martinique, Nicaragua, Oman, Pakistan, Peru, Paraguay, Reunion, Turks and caicos islands, Aruba, Saudi arabia, South africa, United arab emirates, Ukraine, Chile.